We started off with a good breakfast at Denny's, said goodbye to Viv's cousin, and set off for a long day of driving. It was awesome to drive (or in my case, to be driven around) with the sea on one side and mountains on the other. It had started to rain and the weather was getting colder and windier. The plan was to drive to the Channel islands and explore the area. However, when we reached, we realised that it was too windy to do anything. We couldn't even step out for the car for 10 minutes. So we took a short walk and then decided to head towards Santa Barbara. We had lunch at Chipotle in Santa Barbara, and took another walk -- this time a longer one -- around the place. 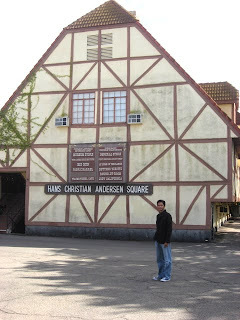 We headed off to the Danish town of Solvang next. I couldn't get enough of the pretty sites on the way! 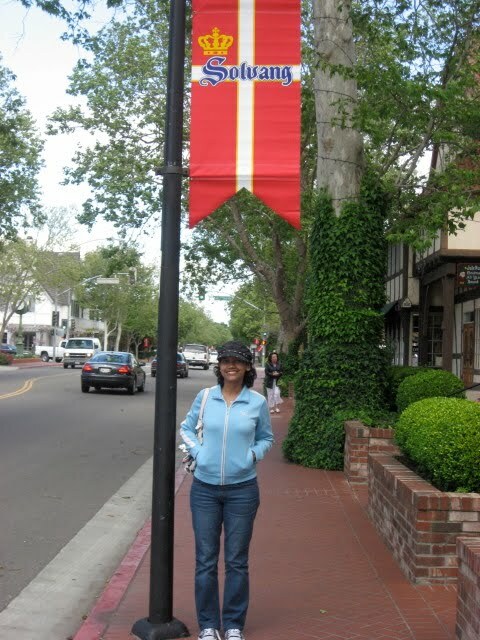 Finally, we had reached Solvang. The town was founded in 1911 by Danish educators who had travelled west to escape winter. The architecture of the town was unlike any other city we had seen so far, as it followed traditional Danish style. The streets were lined with several Danish bakeries. We took a walk around Solvang. Straight out of a postcard! They even had a Hans Christian Andersen square in honour of the Danish fable writer. We had tea, eclairs, and Danish lime pastry at Mortensens, one of the tiny Danish bakeries. It was really cosy and nice. And off we set again, this time to Santa Ynez. We had booked a hotel there to stay the night before heading off again.